If you like your food with a bit of a kick, this recipe for Twice Baked Pepper Stuffed Potatoes is for you! For me, I’m all about the spicy food as long as I have a glass of water nearby. There’s nothing worse than a bland meal with no discernible flavour. If you prefer less of a bite, decrease the spice amounts by half. The little bit of extra prep work is well worth it. The potatoes need to bake in the oven for 1 hour. This step does the majority of the baking process and is necessary so the insides are soft enough to scoop out for the second half of the recipe. Be very careful when scooping out the insides to make your potato shell. I like to use baking potatoes because I find them easier to work with and the skin seems tougher than the other varieties. If you prefer a smoother, creamier filling, use a mixer to whip the potatoes. I didn’t bother with this step because I wanted to get them on the table to eat faster. They are spicy, creamy and loaded with delicious flavour. Serve as a side dish with steak or grilled chicken for a hearty meal. 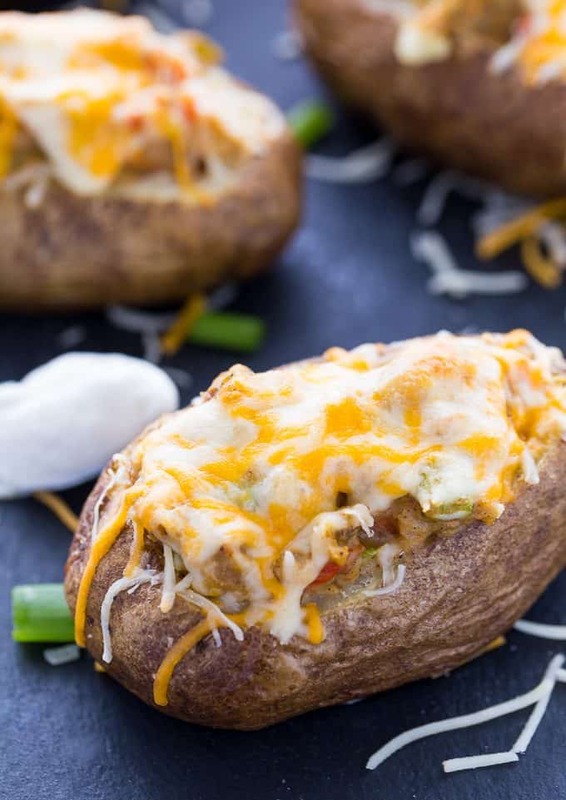 For more potato recipes, check out my Smashed Potatoes with Lemon, Garlic and Feta, Buffalo Twice Baked Potatoes and for a twist, Twice Baked Sweet Potatoes. 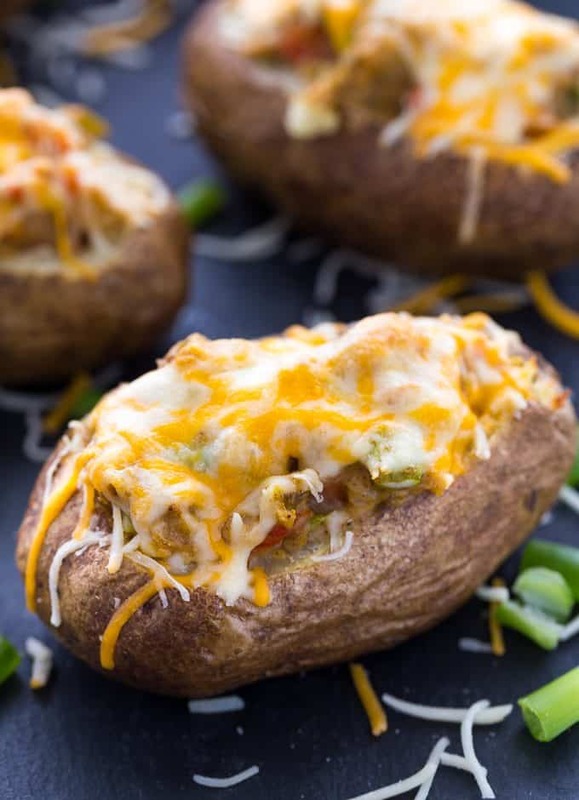 What ingredients do you include in your twice baked potatoes? Spicy, creamy and loaded with delicious flavour. Serve as a side dish with steak or grilled chicken for a hearty meal. Preheat oven to 400F. Poke holes in potatoes with a fork. Rub each potato in olive oil. Set on a baking sheet. Bake for 1 hour. Remove from oven and let cool for 15 to 20 minutes. Cut the top of potatoes lengthwise and carefully spoon out the inside of the potato into a bowl. Add sour cream, butter, cumin and chili powder to the potatoes and mix together. In another bowl, stir red pepper, green pepper, jalapeno, chilies and green onions. Stir into potato mixture. Fill potato shells with the potato mixture. Sprinkle with cheese. Bake at 350F for 20 minutes and serve. I like twice baked potatoes, they’re so good and you can customize them how you want!! These would be so yummy! I do like some spice in my food so these would be great. These look and sound delicious! I’ve never made stuffed potatoes, but may do so now!! This makes my mouth water they look so good. Easy to make as well. Thanks for sharing. This recipe sounds delicious, I just love potatoes. So many ways to use them. I would make these in a heart beat. 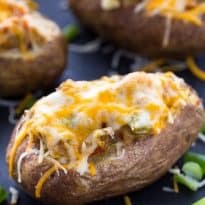 I love twice baked potatoes and these look delicious. I will try your recipe. The potatoes are a family fave!!! I love baked potatoes and I love peppers, why didn’t I ever think to combine the two?! Yummy! I’ve got to try this, thanks for sharing! 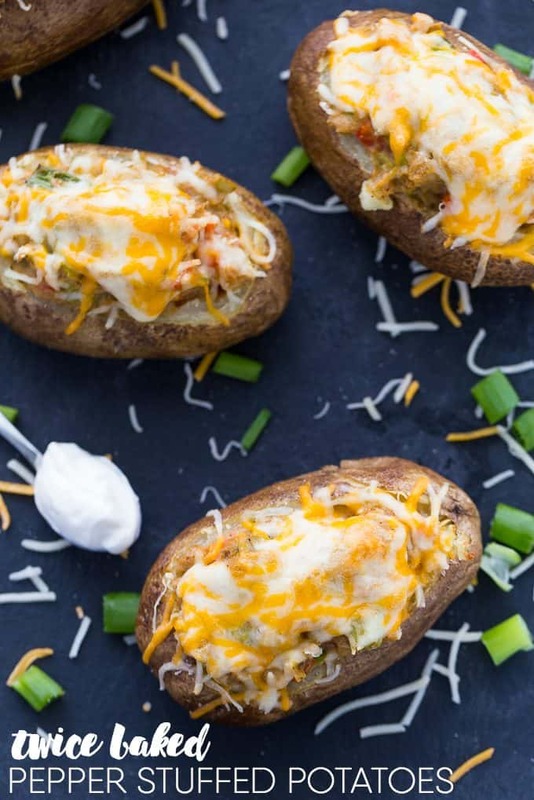 Sounds like a yummy variation to me, we love twice backed stuffed potatoes. Will have to try your recipe out. Yum! I am saving this recipe!! These would be perfect with our next bbq too they look so good with all the fixings will give them a try soon. I love twice baked potatoes! Pinning your recipe to my Recipe board. Thanks for sharing! I’m stopping by from Totally Terrific Tuesday party. YUM! This sounds amazing! 🙂 PINNED! This looks so yummy! I am going to have to add it to our list of meals for the week and try it out! The flavor of your Stuffed Potatoes will be awesome! Thanks so much for sharing with us at Full Plate Thursday, your recipe is great! Hope you have a wonderful week and come back to see us real soon.